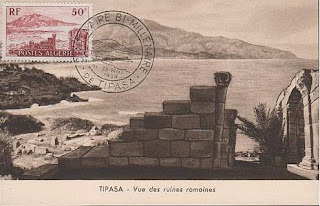 1955 maxi of Tipasa, as it was known in Roman times. Located in modern day Tipaza, it was originally a Punic trading fort, then commandeered by Claudius who turned it into a military colony. It's population expanded, and by the 4th century it boasted 3 basilicas. Destroyed by the vandals in 430, it was reconstructed by Byzantines 100 years later. But, before the close of the 7th century Umayyad forces razed it. 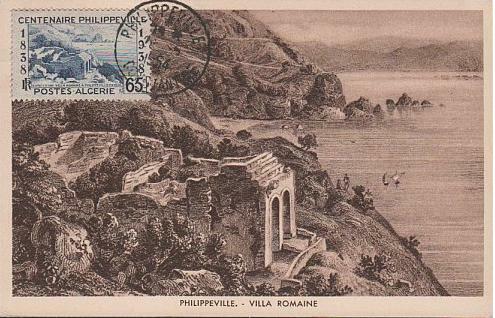 1954 maxi of Roman ruins in Philippeville or Skikda. Early settlement dates to Phoenician times with the Romans establishing a city over top naming it Rusicade, punic for 'promontory of fire'. This port city was wrecked by the vandals in the 5th cent. This stamp is from a set of 5, same image with different colours and values. These are still available on buckacover here (scroll about halfway).